As summer approaches I tend to gear more towards lighter foundations, BB or CC creams, however when I feel I want a little more coverage or want a flawless base I will opt for this amazing trio from the drugstore. 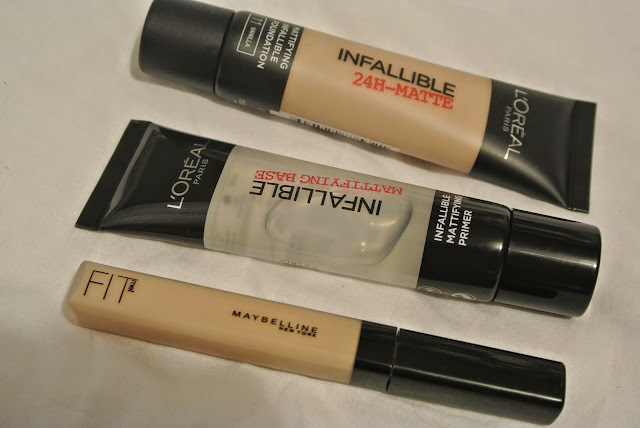 I normally prefer dewy skin however, I love this L'Oreal Infallible 24H-MATTE foundation and primer. This leaves my skin looking matte and poreless all day and is perfect for events because it is full coverage. I have also been loving this Fit Me concealer from Maybelline which is perfect for counteracting darkness and discolouration. I have far too many foundations, some high end and some drugstore but this combo has been my favourite recently. I love how affordable it is too. The foundation and primer are only £7.99 and the concealer is £5.99 which is such great value. Let me know what your favourite base makeup is currently? I love Estee Lauder's Double wear foundation, and I love the Max Factor facefinity primer :) I really want to try the L'Oreal one you mentioned though!